Have you seen it?… That 9×9 grid that has lots of numbers scattered around it. So, what kind of a puzzle is that anyway? And how in the world is anyone supposed to “solve” that thing? After becoming popular in the UK in 2005, Sudoku ended up #7 in the Hottest 100 Web Searches of 2005. Since then, Sudoku has been picked up in all of the major newspapers and tabloids across America. Here is is early 2006, and Sudoku has officially caught on like wildfire! Here’s more about these mind-boggling puzzles, and ways that even you can manage to solve a Sudoku puzzle on your own. Sudoku is the ultimate test of your patience and logical ability. Briefly, your challenge is to complete the large grid by filling in numbers so that every row, column and 3×3 box contains every digit from 1 to 9 inclusive. Fortunately (for people who, like me, get easily frustrated the moment they get stumped), there are puzzles which range from “very easy” to “very difficult”, including about 4 levels in between. Just enter the layout of the particular puzzle that’s got you stumped into this online Sudoku helper and it will walk you through all of the possible solutions! One by one, you’ll be able to use the process of elimination to determine which number (1 through 9) belongs in each box. Online helpers like this are also great tools for beginners, because you can “see” how it’s done before you try to tackle a Sudoku puzzle on your own. 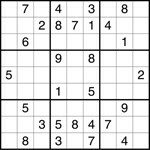 Here’s another online Sudoku puzzle solver. Advanced puzzlers will appreciate these advanced tips & tricks. And yet another great Sudoku tutorial. Have questions? Want to chat with other Sudoku puzzle lovers? Check out the Sudoku Forum. Ready To Try Your Hand At Sudoku? You can try a new Sudoku puzzle every day, then submit your answers and see if you win the daily prize at the official headquarters of Sudoku online! And just for my local peeps… check out the Nashville City Paper’s daily Sudoku puzzle.